I had attempted this entry earlier and was all set to boast about how well I was handling everything -- all of it, the spills and messes and snot and treatments and unwell toddler -- and then this afternoon happened. I'm not sure what exactly happened this afternoon but it involved a fever that just would not break no matter what and poor Ethan felt it, the exhaustion and chills and discomfort (and my stress, I'm sure) and screamed his already sore throat raw for two hours. Two hours. Nothing could comfort him, not rocking in the glider curled up in my arms, not a lukewarm bathtub filled to the brim with his favorite bubbles, not laying in his crib after trying to grant his pleas for "nightnight." Nothing. Like most less than pleasant things, this afternoon passed and after a thirty minute power nap, Ethan awoke in a slightly chipper mood (albeit completely hoarse) ready for more pops. We've spent a great deal of time over yesterday and today making homemade fruit popsicles in paper cups I found shoved in one of our cabinets. I'm not sure what Ethan has loved more, concocting his own special recipes or devouring the icy-cold popsicles once they're frozen (the freezing a process he absolutely detests waiting for, I've learned). 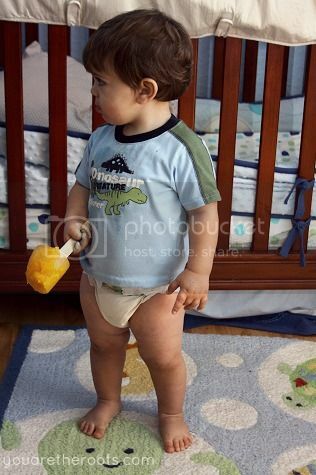 After exploring all of the fruit available for selection in our refrigerator, Ethan began narrowing down his most favorite homemade fruit pop recipes of all the ones we made. I've always been hesitant to purchase store-bought popsicles, noting the exorbitant amount of sugar or syrups listed in the ingredient panel. These were delicious, all natural and a great indoor activity to get children excited about eating healthily and interested in exploring the kitchen! 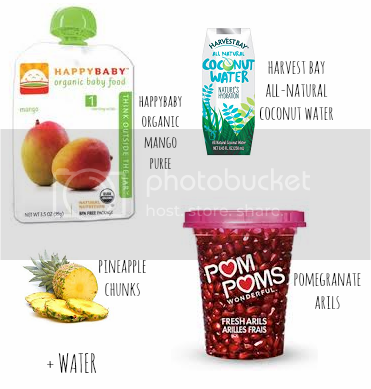 To make these pomegranate & pineapple pops, add a pouch of Happy Baby organic mango puree to a cup. Stir in 1/2c water and 1/2c coconut water until combined. Ethan and I squeezed the juice out of a few chunks of pineapple into the mixture and he also threw in a couple toddler-sized handfuls of pineapple chunks. 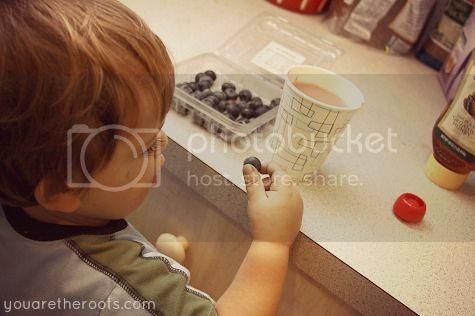 He had a blast sprinkling the pomegranate arils in towards the end. 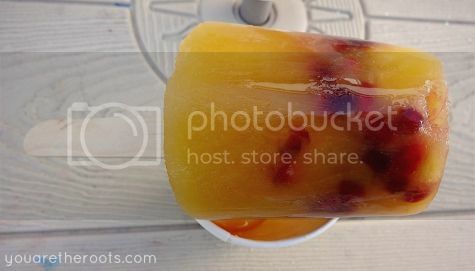 Freeze for one hour, remove from the freezer, add a stick into the slushy mix and continue freezing until frozen through! 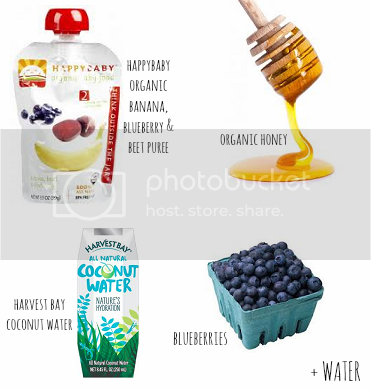 To make this blueberry & honey pop, squirt a pouch of Happy Baby organic beet, banana & blueberry fruit puree into a cup. Add 1/2c water and 1/2c coconut water. Add a few squirts of organic honey and stir to combine. Once everything is combined, throw in a few blueberries to your liking. Freeze for one hour. After one hour, remove from freezer, add a stick into the slushy mix and continue freezing until frozen through! 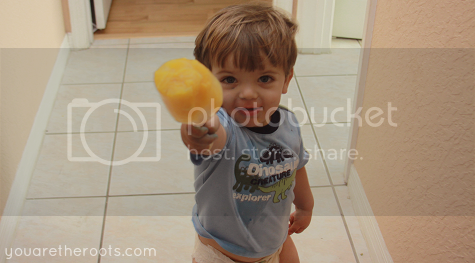 To make this citrus & pear popsicle, squeeze a pouch of Happy Baby organic pear puree into a cup. Add 1/2c water and 1/2c coconut water. Squeeze the juice of a fresh lemon and stir into the mixture until combined. Add chunks or slices of orange and stick in the freezer. Remove from the freezer after one hour, stick a popsicle stick into the slushy mixture and continue freezing until frozen through! This is great! I'm eager to give it a try and see what my little man likes best. Hope your sweetie starts feeling better real soon and that you all get a good nights rest! 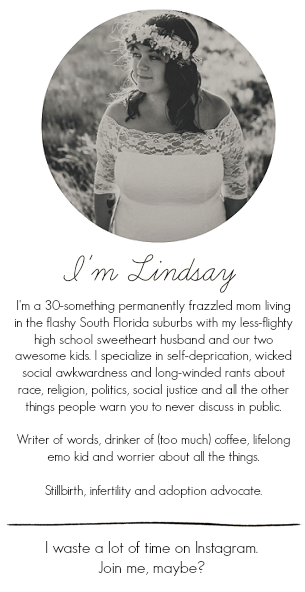 Thank you, Thank you, Thank you for this Lindsey! 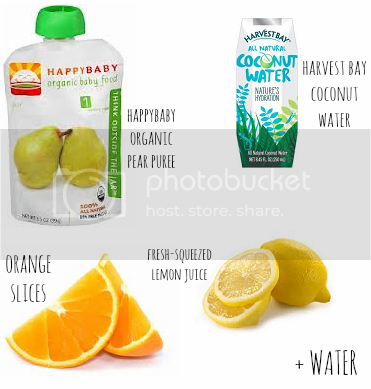 I think that my flu-sicky little girl would love these and it never crossed my mind to use my son's happy baby pureed pouches for Popsicles. Awesome. Hope your little guy is on the mend. The plague still resides over here! blah. ummm...I WANT TO EAT THESE! Haha, the orange one was my favorite! It's pretty clever to use those pureed fruit pouches. You know my girls are 4 and 2 now and they STILL will enjoy those every once in awhile. Sometimes instead of the cookie at Publix while we are shopping I'll let them each pick one of those...and they are the BEST on car trips. I had never thought about using them for popsicles! Nope, not at all! It's just pureed fruit -- you could even puree your own or use something like applesauce! 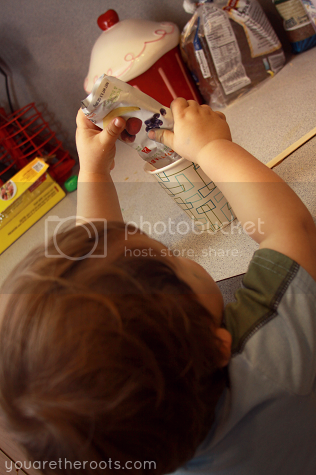 Love the organic puree pouches, though! Hope you all get good rest...... Feel better soon Ethan. 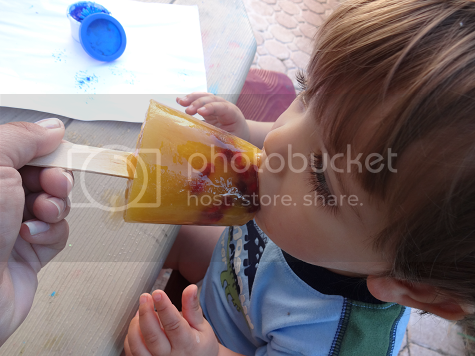 We love homemade fruit pops but I usually don't add any liquid. I love the idea of cocnut water! Thanks Lindsey! Aww poor baby. So sorry he was sick. 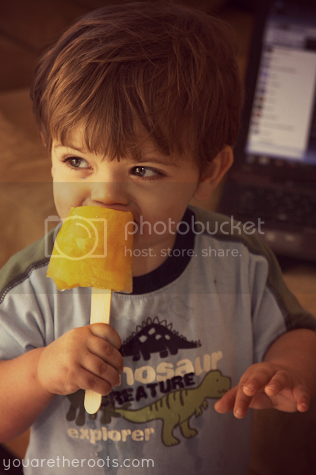 But so awesome the popsicles he got to make! Those look amazing!! The ingredients and combos sound delicious! Pomegranate arils? Is that the seeds? I have never heard that before!